An Arm Lift – also known as an ‘Arm Reduction’, reshapes the upper arm, removing the excess skin caused by natural ageing or following weight loss, including loose skin that extends from the underarm area to the elbow that often creates ‘tuck shop arms’ or ‘bat wings’. Liposuction can sometimes be used in combination to achieve the best results. Every year, thousands of people undergo successful Arm Lift surgery, with excellent noticeable results. Many people are self-conscious about the presence of excessive fat and skin under the arms, so an Arm Lift procedure may be ideal for patients who are bothered by the loose skin hanging from their arms. The incisions are generally made on your elbows, extended down the arms, or concealed within the armpits in an inconspicuous location. The location, length and direction of these incision lines will be dictated by the type of Arm Lift you that is recommended by your Surgeon. A skilled Plastic Surgeon will remove the excess skin, and may need to use Liposuction to remove any excess fat. Your Surgeon will then carefully bring the incisions together, to optimise scarring and provide a smooth contour of the arms. Mini (Auxiliary) Brachioplasty – This procedure is performed by pulling the excess hanging skin upwards, and tuck the excess skin into the armpit. This works best if the patient has loose, crepe-like skin in the lower inner arm area near the armpit, and does not have too much excess fatty tissue. 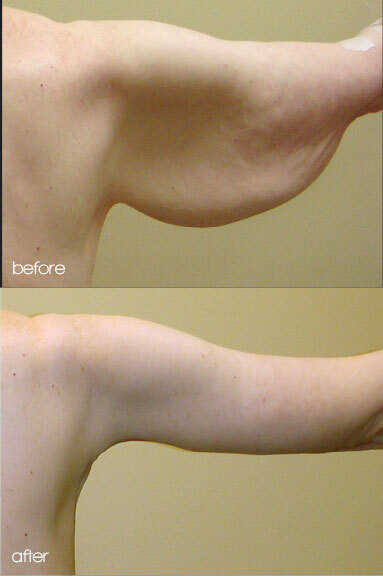 Full or Standard Brachioplasty – If the excess skin extends like a ‘bat wing’ from the armpit to the elbow, the only option is to remove the arm flab in a Standard Brachioplasty. Extended Brachioplasty – The incision is extended along the arm and into the chest area to include loose skin and fatty tissue that is just under the arm along the side of the chest wall. 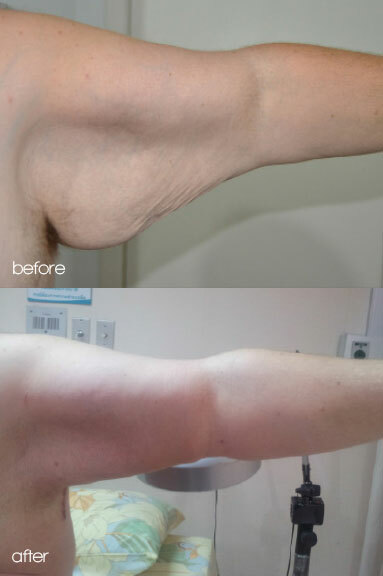 The Extended Arm Lift is similar to a Standard Brachioplasty, except the loose skin is common in this area for patients who have had massive weight loss. Liposuction – May also be used as in conjunction with a Brachioplasty procedure for fat removal on patients that have enough elasticity in their skin to shrink around the remaining tissues after the fat is removed. If the skin has poor elasticity, tissue sagging will be even more pronounced after fat is removed. Learn more about Liposuction. Weight loss, ageing and exposure to the sun all lead to stretching, sagging and wrinkling of the skin. Liposuction by itself will not improve this. 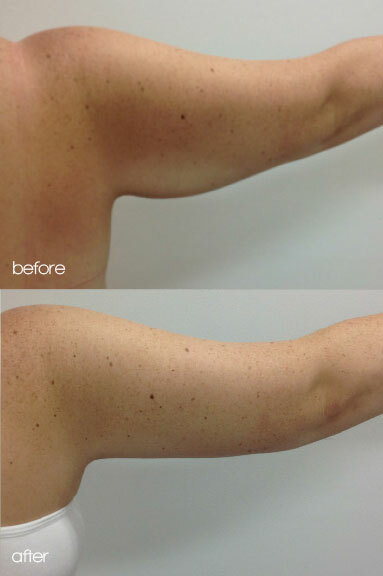 Arm Lift surgery removes the extra skin so that the arm appears to be thinner. Scars are a normal part of surgery. The amount of scarring will depend on your own anatomy and how you heal. It is also important for you to know where the incisions will be placed and how far they will go. The length of the scar will depend on how much extra skin is present. After surgery some patients may experience a feeling of tightness on the upper part of the arm due to the area swelling as a result of surgery. Another common side effect is a feeling of tingling in the hands which like other symptoms will resolve relatively quickly. The recovery period will differ depending on if the Arm Lift procedure is the only procedure or there is a combination of other procedures. Every patient’s healing time is different, but by carefully following the instructions from your Plastic Surgeon, you will minimise potential problems and help aid and speed up your recovery. Generally, certain physical activities such as exercising are restricted for up to two weeks, and you will be asked to wear a post-surgery compression garment to aid the healing process.